Steve Davies has always had hockey in his blood. His desire and passion for the game has allowed him to play at high levels of hockey all around the world. With all his experiences throughout his career as a player it allowed him to start Hesepler Hockey and now is the owner of Winnwell Hockey. Winnwell’s main objective is to offer a quality product at an affordable price to its customers. With the cost of minor hockey forever rising, Winnwell is working with the North York Hockey league to “Face off Against High Prices.” Read his Face to Face interview with NYHL below! Where did you play minor hockey growing up? I grew up in the Keele and Wilson area and started playing with the Downsview Boys Club out of Downsview Arena when I was 5 or 6. My dad, “Curly” Davies, was the arena manager at Downsview arena before moving on to manage what is now the Herbert Carnegie (formerly North York Centennial) arena in 1967. What was the most defining moment in your minor hockey career? When I was a minor midget, the Toronto Maple Leafs would practice at North York Centennial Centre in the afternoon. I would leave school early, go watch their practice and go out on the ice myself when their practice was finished. It was pretty cool having some of your idols (Jim McKenney, Borje Salming , Darryl Sittler etc) come out after practice and watch you. This commitment to ‘practice’ led to my being offered a full hockey scholarship to play at a Division I school in the US. What did you like best about minor hockey? I absolutely loved the game, practice, games, shinny, everything!! The friendships with your teammates, the dressing room dynamic leading up to a big game – the coaches ‘speech’ – I loved it all. What did you like least about minor hockey? When I really young we would practice outdoors at Roding Arena. I walked to the rink and although I knew I would love every minute on the ice, I dreaded the thought of my toes ‘thawing’ out afterwards. Absolutely! In my business everyone involved has a different skill set and we all work together to help ensure success. You started Hespeler hockey. How did you get into the business and why did you choose that industry? I started the business in 1977 with a friend of mine who was a goalie with the Sudbury Wolves of the OHL. We had a distribution company called International Stick. Over the next 13 years we became the largest distributor of hockey sticks in North America. I think when I look back, the industry actually chose me. It was an opportunity to be in a business with the game that I loved the most. I didn’t need to be taught what made a good hockey stick as this came naturally to me from all my experience as a player. You now are the owner of Winnwell. Can you tell us a bit about that business? The company has been around since 1906 and was originally called Wellinger and Dunn. During the 1960’s the name was changed to “Winnwell”. I had the opportunity to buy the company in 2004. My goal was to transform this ‘heritage brand’ into a company that created high quality, affordable hockey products that the consumer could identify with, very ‘authentic’ yet ‘grass roots’ focused. Winnwell is “All About the Game”!! What makes Winnwell products unique? 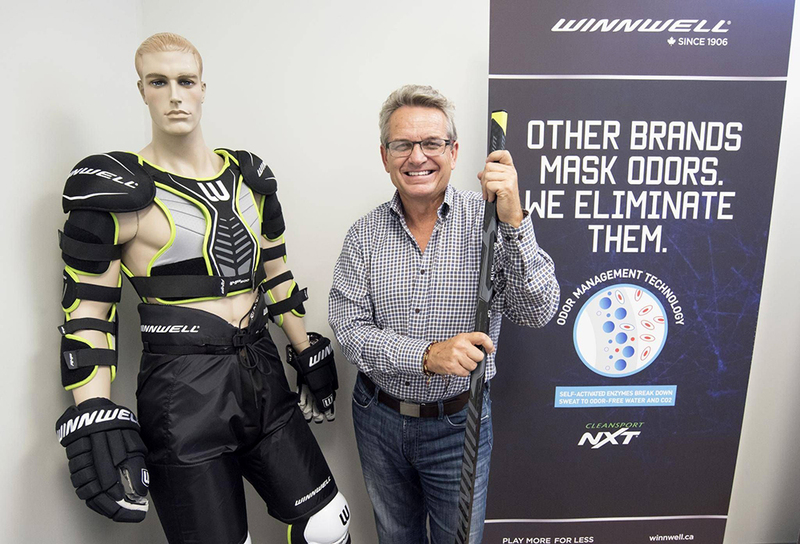 When we launched the ‘new’ Winnwell in 2007 we did so by introducing “Cleansport NXT” to our line of protective hockey equipment. This “Odor Management Technology” is environmentally friendly and eliminates the offensive odors in hockey equipment. I can hear all “Hockey Mom’s” saying “it’s about time”!!! In the past year we’ve introduced a “2 x’s Warranty” to our one piece composite stick business, thereby increasing the industry standard 30-day warranty to 60 days. We try to build ‘great value’ into all our products. With the cost of minor hockey rising, how do you manage to keep your products cost effective? When compared to other brands, Winnwell elects not to get involved in the high costs associated with Pro Player endorsements which result in higher prices to the consumer. We like to think of ourselves as a high performance product without the “BLING”. The NYHL and Winnwell have the same objective in that we both aim to keep the costs down in order to allow more kids to play. How is important is that to your company? It is extremely important to us. We want to help increase the participation number in hockey worldwide. The game has gone from being an ‘inclusive’ sport, where just about anyone could play, to an ‘exclusive’ game where the high cost of participating could rule a lot of people out. They should play the game for the right reasons – FUN / Great exercise!!?? You have played hockey at some high levels from U.S college to Europe, what is the best advice you can pass along to parents on how to approach their children’s involvement in sports? Allow your kids to play the sports that they are interested in and more importantly, those sports that are fun for them to play. Don’t get caught up how competitive their league is or how you can help them take the next step forward to be a more competitive player. Be there to support their interest and applaud their efforts!! Everything else will take care of itself. Thanks to Steve Davies for his time! We’ve had Face to Face chats with all sorts of interesting folks! Read all of our interviews.